The active zone or synaptic active zone is a term first used by Couteaux and Pecot-Dechavassinein in 1970 to define the site of neurotransmitter release. Two neurons make near contact through structures called synapses allowing them to communicate with each other. As shown in the diagram on the right, a synapse consists of the presynaptic bouton of one neuron which stores vesicles containing neurotransmitter (uppermost in the picture), and a second, postsynaptic neuron which bears receptors for the neurotransmitter (at the bottom), together with a gap between the two called the synaptic cleft (with synaptic adhesion molecules, SAMs, holding the two together). 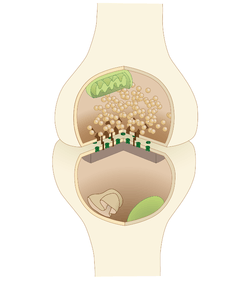 When an action potential reaches the presynaptic bouton, the contents of the vesicles are released into the synaptic cleft and the released neurotransmitter travels across the cleft to the postsynaptic neuron (the lower structure in the picture) and activates the receptors on the postsynaptic membrane. The active zone is present in all chemical synapses examined so far and is present in all animal species. The active zones examined so far have at least two features in common, they all have protein dense material that project from the membrane and tethers synaptic vesicles close to the membrane and they have long filamentous projections originating at the membrane and terminating at vesicles slightly farther from the presynaptic membrane. The protein dense projections vary in size and shape depending on the type of synapse examined. One striking example of the dense projection is the ribbon synapse (see below) which contains a "ribbon" of protein dense material that is surrounded by a halo of synaptic vesicles and extends perpendicular to the presynaptic membrane and can be as long as 500 nm! The glutamate synapse contains smaller pyramid like structures that extend about 50 nm from the membrane. The neuromuscular synapse contains two rows of vesicles with a long proteinaceous band between them that is connected to regularly spaced horizontal ribs extending perpendicular to the band and parallel with the membrane. These ribs are then connected to the vesicles which are each positioned above a peg in the membrane (presumably a calcium channel). Previous research indicated that the active zone of glutamatergic neurons contained a highly regular array of pyramid shaped protein dense material and indicated that these pyramids were connected by filaments. This structure resembled a geometric lattice where vesicles were guided into holes of the lattic. This attractive model has come into question by recent experiments. Recent data shows that the glutamatergic active zone does contain the dense protein material projections but these projections were not in a regular array and contained long filaments projecting about 80 nm into the cytoplasm. The release of neurotransmitter is accomplished by the fusion of neurotransmitter vesicles to the presynaptic membrane. Although the details of this mechanism are still being studied there is a consensus on some details of the process. Synaptic vesicle fusion with the presynaptic membrane is known to require a local increase of calcium from as few as a single, closely associated calcium channels and the formation of highly stable SNARE complexes. One prevailing model of synaptic vesicle fusion is that SNARE complex formation is catalyzed by the proteins of the active zone such as Munc18, Munc13, and RIM. The formation of this complex is thought to "prime" the vesicle to be ready for vesicle fusion and release of neurotransmitter (see below: releasable pool). After the vesicle is primed then complexin binds to the SNARE complex this is called "superprimed." The vesicles that are superprimed are within the readily releasable pool (see below) and are ready to be rapidly released. The arrival of an action potential opens voltage gated calcium channels near the SNARE/complexin complex. Calcium then binds to changes the conformation of synaptotagmin. This change in conformation of allows synaptotagmin to then dislodge complexin, bind to the SNARE complex, and bind to the target membrane. When synaptotagmin binds to both the SNARE complex and the membrane this induces a mechanical force on the membrane so that it causes the vesicle membrane and presynaptic membrane to fuse. This fusion opens a membrane pore that releases the neurotransmitter. The pore increases in size until the entire vesicle membrane is indistinguishable from the presynaptic membrane. The presynaptic bouton has an efficiently orchestrated process to fuse vesicles to the presynaptic membrane to release neurotransmitters and regenerate neurotransmitter vesicles. This process called the synaptic vesicle cycle maintains the number of vesicles in the presynaptic bouton and allows the synaptic terminal to be an autonomous unit. The cycle begins with (1) a region of the golgi apparatus is pinched off to form the synaptic vesicle and this vesicle is transported to the synaptic terminal. At the terminal (2) the vesicle is filled with neurotransmitter. (3) The vesicle is transported to the active zone and docked in close proximity to the plasma membrane. (4) During an action potential the vesicle is fuses with the membrane, releases the neurotransmitter and allows the membrane proteins previously on the vesicle to diffuse to the peri-active zone. (5) In the peri-active zone the membrane proteins are sequestered and are endocytosed forming a clathrin coated vesicle. (6) The vesicle is then filled with neurotransmitter and is then transported back to the active zone. The periactive zone surrounds the active zone and is the site of endocytosis of the presynaptic terminal. In the periactive zone, scaffolding proteins such as intersectin 1 recruit proteins that mediate endocytotis such as dynamin, clathrin and endophilin. In Drosophilia the intersectin homolog, Dap160, is located in the periactive zone of the neuromuscular junction and mutant Dap160 deplete synaptic vesicles during high frequency stimulation. The ribbon synapse is a special type of synapse found in sensory neurons such as photoreceptor cells, retinal bipolar cells, and hair cells. Ribbon synapses contain a dense protein structure that tethers an array of vesicles perpendicular to the presynaptic membrane. In an electron micrograph it appears as a ribbon like structure perpendicular to the membrane. Unlike the 'traditional' synapse, ribbon synapses can maintain a graded release of vesicles. In other words the more depolarized a neuron the higher the rate of vesicle fusion. The Ribbon synapse active zone is separated into two regions, the archiform density and the ribbon. The archiform density is the site of vesicle fusion and the ribbon stores the releasable pool of vesicles. The ribbon structure is composed primarily of the protein RIBEYE, about 64-69% of the ribbon volume, and is tethered to the archiform density by scaffolding proteins such as Bassoon. ↑ Missler M, Südhof TC, Biederer T (2012). "Synaptic cell adhesion". Cold Spring Harb Perspect Biol. 4 (4): a005694. doi:10.1101/cshperspect.a005694. PMC 3312681 . PMID 22278667. ↑ Craig C. Garner and Kang Shen. Structure and Function of Vertebrate and Invertebrate Active Zones. Structure and Functional Organization of the Synapse. Ed: Johannes Hell and Michael Ehlers. Springer, 2008. ↑ Zhai R. Grace; Bellen Hugo J. (2004). "The Architecture of the Active Zone in the Presynaptic Nerve Terminal". Physiology. 19 (5): 262–270. doi:10.1152/physiol.00014.2004. 1 2 Phillips GR; et al. (2001). "The presynaptic particle web: ultrastructure, composition, dissolution, and reconstitution". Neuron. 32 (1): 63–77. PMID 11604139. ↑ Mark L.; et al. "Harlow et al. The architecture of active zone material at the frog's. neuromuscular junction". Nature. 409: 2001. ↑ Siksou; et al. (2007). "Three-Dimensional Architecture of Presynaptic Terminal Cytomatrix". The Journal of Neuroscience. 27 (26): 6868–6877. doi:10.1523/jneurosci.1773-07.2007. PMID 17596435. ↑ Ziv , Garner (2004). "Cellular and molecular mechanisms of presynaptic assembly". Cellular and Molecularmechanisms of Presynaptic Assembly. 5 (5): 385–399. doi:10.1038/nrn1370. ↑ Georgiev, Danko D .; James F . Glazebrook (2007). "Subneuronal processing of information by solitary waves and stochastic processes". In Lyshevski, Sergey Edward. Nano and Molecular Electronics Handbook. Nano and Microengineering Series. CRC Press. pp. 17–1–17–41. doi:10.1201/9781420008142.ch17 (inactive 2015-05-20). ISBN 978-0-8493-8528-5. ↑ Heidelberger; et al. (1994). "Calcium dependence of the rate of exocytosis in a synaptic terminal". Nature. 371 (6497): 513–515. Bibcode:1994Natur.371..513H. doi:10.1038/371513a0. PMID 7935764. ↑ Stanley EF (1993). "Single calcium channels and acetylcholine release at a presynaptic nerve terminal". Neuron. 11 (6): 1007–1011. doi:10.1016/0896-6273(93)90214-c. PMID 8274272. ↑ Pang Z.; Sudhof T. (2010). "Cell biology of Ca2+-triggered exocytosis". Current Opinion in Cell Biology. 22 (4): 496–505. doi:10.1016/j.ceb.2010.05.001. PMID 20561775. ↑ Carr C.; Munson M. (2007). "Tag team action at the synapse". EMBO Reports. 8 (9): 834–838. doi:10.1038/sj.embor.7401051. PMID 17767192. ↑ Jung Nadja; Haucke Volker (2007). "Clathrin-Mediated Endocytosis at Synapses". Traffic. 8 (9): 1129–1136. doi:10.1111/j.1600-0854.2007.00595.x. PMID 17547698. ↑ Ping Chi; Paul Greengard; Timothy A Ryan (10 April 2003). "Synaptic Vesicle Mobilization Is Regulated by Distinct Synapsin I Phosphorylation Pathways at Different Frequencies". Neuron. 38 (1): 69–78. doi:10.1016/S0896-6273(03)00151-X. ↑ Cesca et al. 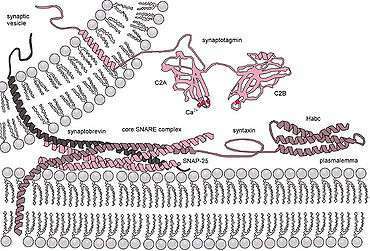 (2010) The synapsins: Key actors of synapse function and plasticity. Progress in Neurobiology. Vol. 91. 313-348. ↑ Dergai; et al. (2010). "Intersectin 1 forms complexes with SGIP1 and Reps1 in clathrin-coated pits". Biochemical and Biophysical Research Communications. 402 (2): 408–413. doi:10.1016/j.bbrc.2010.10.045. PMID 20946875. ↑ Marie; et al. (2004). "Dap160/Intersectin Scaffolds the Periactive Zone to Achieve High-Fidelity Endocytosis and Normal Synaptic Growth". Neuron. 43 (2): 207–219. doi:10.1016/j.neuron.2004.07.001. PMID 15260957.